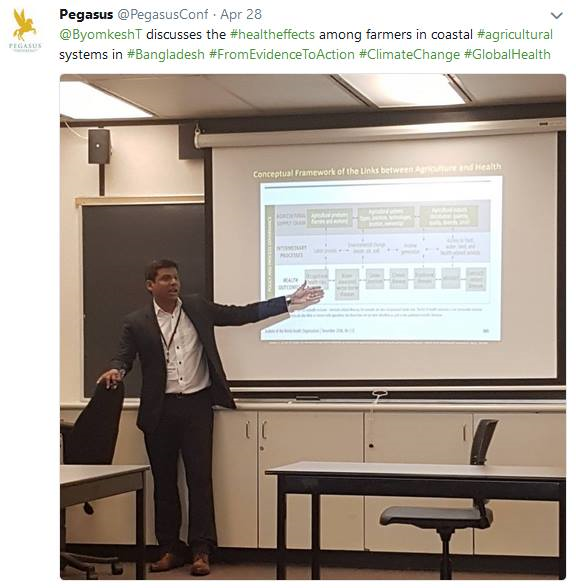 Dr. Byomkesh Talukder presents his research on Health Effects among Farmers of the Coastal Agricultural Systems of Bangladesh at the 2018 Pegasus Conference in Toronto, Ontario. To understand the health impacts of the agricultural practices among farmers of five different agricultural systems in coastal Bangladesh (i.e., shrimp-based, shrimp-and-rice-based, improved rice-based, rice-shrimp-and-vegetable-based and traditional), this study utilizes data from a questionnaire survey, field observations, and key informant interviews to investigate the health effects of the agricultural systems in term of four dimensions: calorie intake from self-grown staple food, water borne infectious disease, physical activities and non-infectious diseases of farmers. The investigation reveals that with respect to shrimp-based agricultural systems, a higher percentage of farmers are affected by water borne infectious disease and the percentage of calories contained in the self-grown food is low for these farmers. Moreover, an integrated systems approach, which is the rice-shrimp-and-vegetable-based agricultural system, involves the most physical activity. Therefore, this study recommends that special interventions are needed to reduce the health effects in shrimp-based agriculture systems for long-term sustainability of the coastal agricultural systems of Bangladesh.